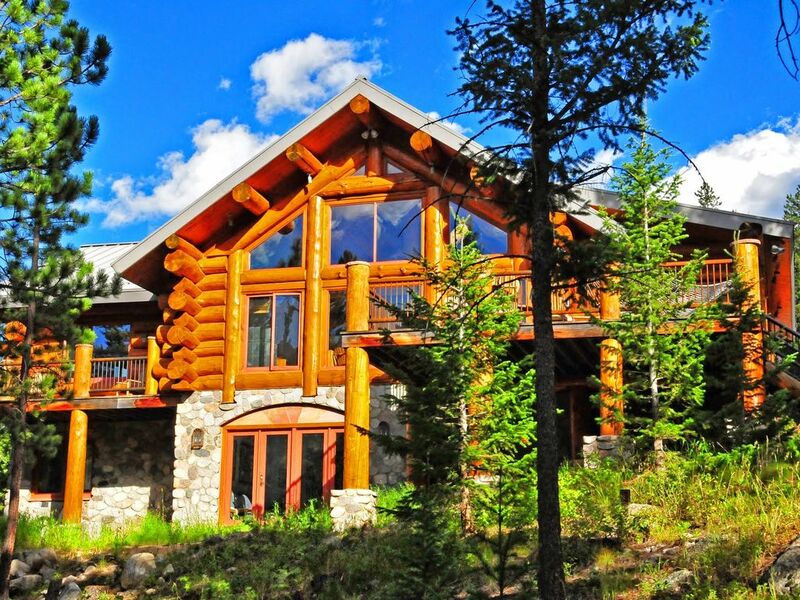 Colorado custom log home situated on 20 isolated acres on the edge of the Rocky Mountain National Park and the North St. Vrain Creek. With Mount Meeker towering overhead there is convenient access to trails leading up to waterfalls, high mountain lakes and fields of wildflowers. Hiking downstream one can fish for wild native trout through a protected 10 mile canyon. Otherwise sit beside the roaring creek and read, write or paint amongst the deer, elk, ouzel and fluttering aspen. Walk back through the woods to the lodge and join the folks who never left the cozy Tulakivi fireplace surrounded by ancient Ingelman Spruce and vaulted ceiling gazing out onto the forest and fourteen thousand foot Mt. Meeker. Enjoy barbeque on the sun-bathed deck or quietly around the candlelit table while the kids rampage downstairs on the bunks, play ping-pong, watch movies, play in the tipi, play basketball, toss horseshoes or jump on the trampoline. Fall asleep to the sound of tumbling waters and a canopy of stars. Awaken to the pink hues of dawn cascading down the sleeping Mountain. After several days of wilderness experience, drive 20 minutes into the resort town of Estes Park and enjoy the full fare of entertainment. Drive further over the highest continuous road in the country which traverses the Continental Divide and drops down into the Colorado River basin and Grand Lake. Enjoy all that the Rockies have to offer on the Colorado River and National Park trails. Return home to our lodge in Wild Basin by way of Mary's Lake, Baldpate Inn, Eagle Plume's Cabin and St. Malo's Chapel on the Rock. Settle back into this cozy log hideaway and enjoy the perfect Rocky Mountain holiday you'll want to relive. Retired physician who enjoys family time, hiking and fishing at the Lodge. Quiet wilderness experience with all the comforts of home. Blissful sanity. Listening to the river. Loved wlld creek lodge!!! Had the most exciting and peaceful stay. Saw black bear, deer and beautiful sites. Thank you Jon. Wonderful home, wonderful location, wonderful hosts! If you are coming to enjoy Rocky Mountain National Park, i can’t imagine you could do better than this. The home is lovely and is well equipped. Six of us stayed for 6 nights eating almost every meal in. The kitchen is very well equipped, the living spaces are comfortable and inviting, but the outdoor spaces are the prize! The roar of the creek made for the most wonderful sleep. The kids enjoyed the basketball hoop and ping pong. You are less than a mile from the Wild Basin entry to RMNP and 30 minutes from the main entrance and Estes Park. Awesome place! Close to RMNP. We had a great time here! The lodge is amazing. The creek was relaxing and the kids loved the ping pong table. The lodge is well maintained and well stocked. The lodge is close to RMNP and Estes Park. After exploring the park all day it was great to come back to the lodge and relax on the deck and listen to the river. The lodge was perfect and we can’t wait to go back! Thank you for letting us stay! Wild Creek Lodge was the best!!! Three generations gathered for a wonderful week relaxing at the cabin, exploring Rocky Mountain National Park, Estes Park and the surrounding area. The lodge far exceeded our expectations. The property, the views, the stream are amazing. The lodge is completely stocked with everything we needed to cook, play and relax. We have rented many vacation homes before and this one is truly exceptional. We hope to be back one day. Amazing property, peaceful, right next to RMNP! This property is fantastic! The owners are not only really nice, but they do a great job keeping this home in great condition. The St. Vrain Creek was amazing to watch, the humming birds were really fun to observe, we saw a ton of other fun colorful birds, and a huge mama mule deer on the property. My kids loved the trampoline and the basketball court, and all that is just outside the property. There is everything you could possibly need in the kitchen, the appliances worked great for our needs, and we grilled outdoors every evening. This home is nestled in the mountains and you cannot see or hear any traffic. It's also right across the street from Rocky Mountain National park. We had so much fun hiking and exploring the park during the day and then to be able to relax at night with our family and enjoy this property. We never even thought about going out to a restaurant for dinner. It really is the type of vacation we hoping to have, nothing disappointed us. Thank You!! Cabin was in perfect location, about 20 minutes from downtown Estes Park and a private location next to roaring river on plenty of land to explore. Everybody enjoyed being able to hear the river at night to fall asleep to. Kitchen was well stocked and had everything we needed for our meals. We loved the sitting area off the kitchen to watch all the humming birds outside the window. Kids loved the ping pong table and movies and games downstairs. Saw deer and foxes while on the property. Owner was great and made a point to make sure he introduced himself. The cabin was perfect and we cannot wait to visit again. Rocky Mountain National Park is just across the street for hiking, fishing, horseback riding. Fall is beautiful Aspen trees and bugling elk. Nordic skiing and snowshoeing is nearby but alpine skiing is 45 drive to Eldora Ski Area. Minimum stay is 7 nights or $3150 with no exceptions. No pets please. Absolutely no smoking! No outdoor fires. Please refer to the agreement for the cancellation fee which differs from the HomeAway standard policy.